You are currently browsing the category archive for the ‘Challenge’ category. Wow! I overcame a 6-6-6-6 start in the first round of the Walla Walla City Championship, steadying my nerves to post my best round of the year. Eight over after four, I finished the front nine in ten over 46. A decent comeback for a twenty handicapper. After double-bogeying number ten, the magic began. Par saves and a birdie chip-in were mixed with long, powerful, straight drives. I left a few wedge/9-iron shots WAY short of greens, only to hit sweet recovery wedges and crucial putts on some of them. It was so fun! I toured the back in 39, netting 65 for the day. It put me in position to challenge in the open division (white tees), sandwiched between the championship contenders (blue tees) and the seniors (gold tees). I am so excited for tomorrow! 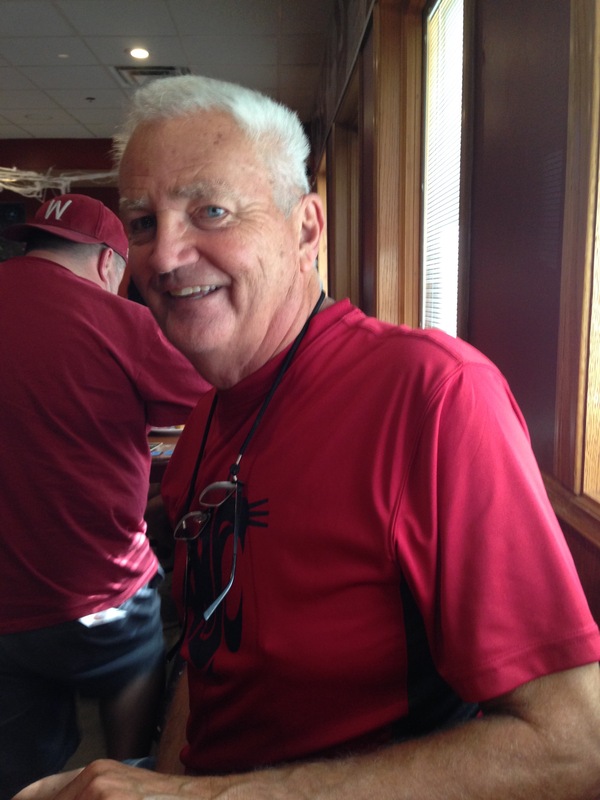 I love Cougar country, with powerful lions trekking our highlands and our gridiron. Our seven mile run on Sunday was hard, after the post-marathon layoff and Saturday’s leg workout with Nick, Annie and Jaslyn. After the run, we saw Gabe Marks. Cool! Equally hard was the first quarter of football. Whoa! I apologized to Annie for the worst game of the year. Like I was playing? Down 14-0 with 21-0 forthcoming, our Cougars drew a definitive line in the sand. A dreamy game changed nightmare into fantasy. The upbeat game of the year! Wow! 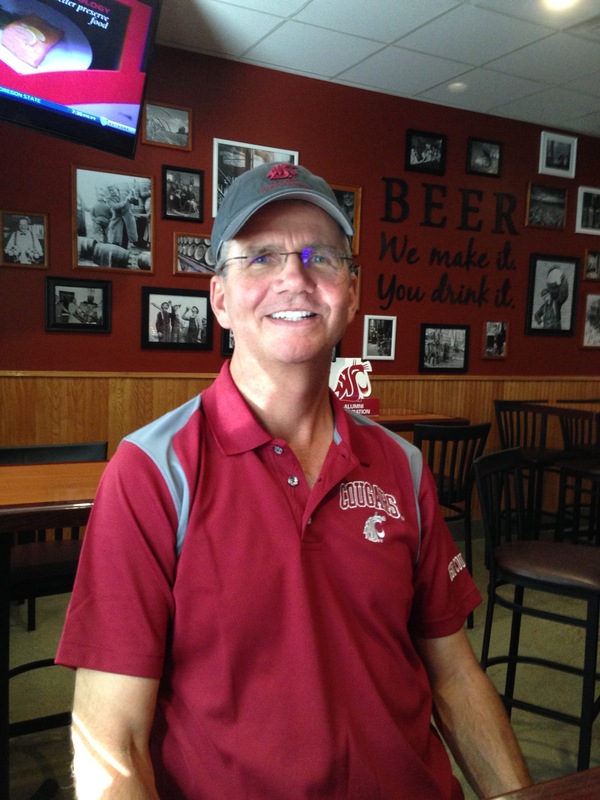 Thanks Cougs! Thanks Mike for the taste of Club level life. It is amazing! The rain pounded me on the drive home and then soaked my beautiful Redwood. It’s the season to run and spin and lift and step my way to awe-inspiring mountains. Yeah! That’s it! That’s what I’ll do! 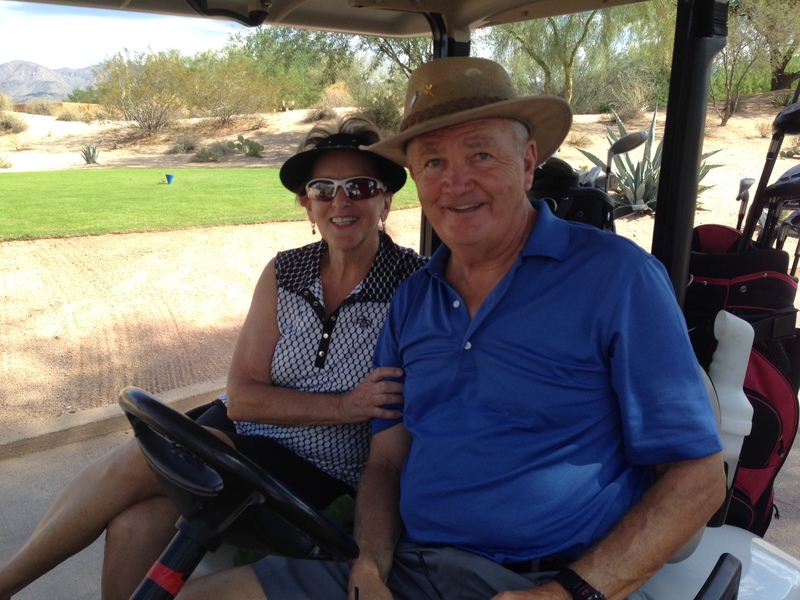 Lyn and Pat live the good life, including amazing golf at Tonto Verde Peaks course. 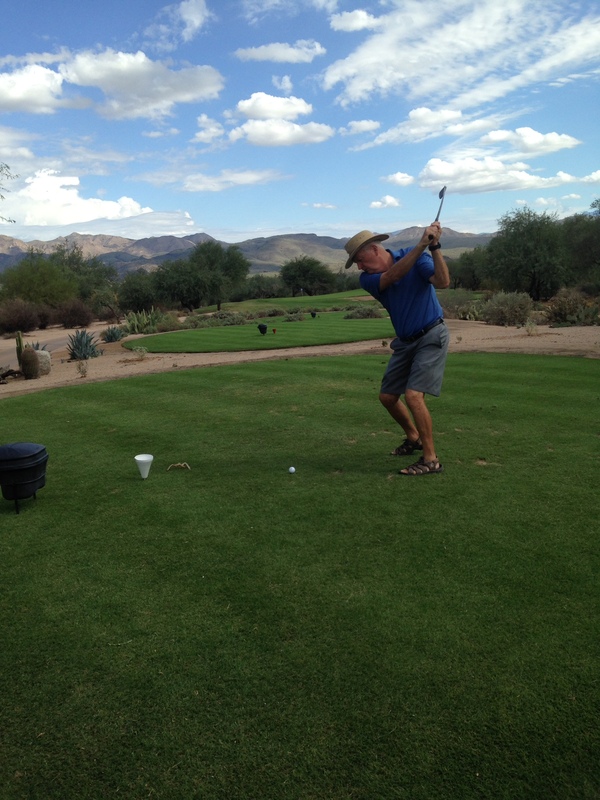 Lyn’s net 69 mastered the inaugural Desert Classic at Tonto Verde’s Peaks course, which was lovely in almost every way. Lyn won match play over both Pat and I. 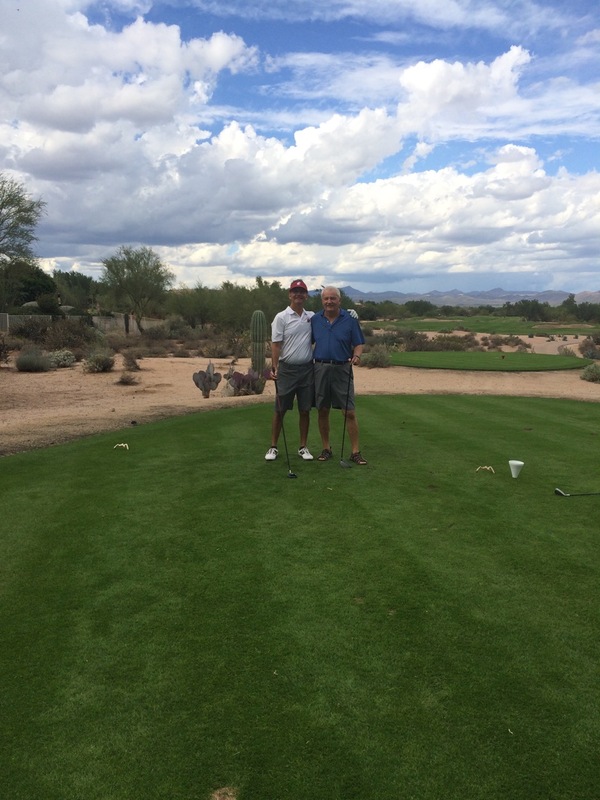 Desert golf is brothers’ bonding in an amazing way! The greens were slow, the translation suggested foolish greens, which looked like they’d be incredible when fast. The views were magnificent. 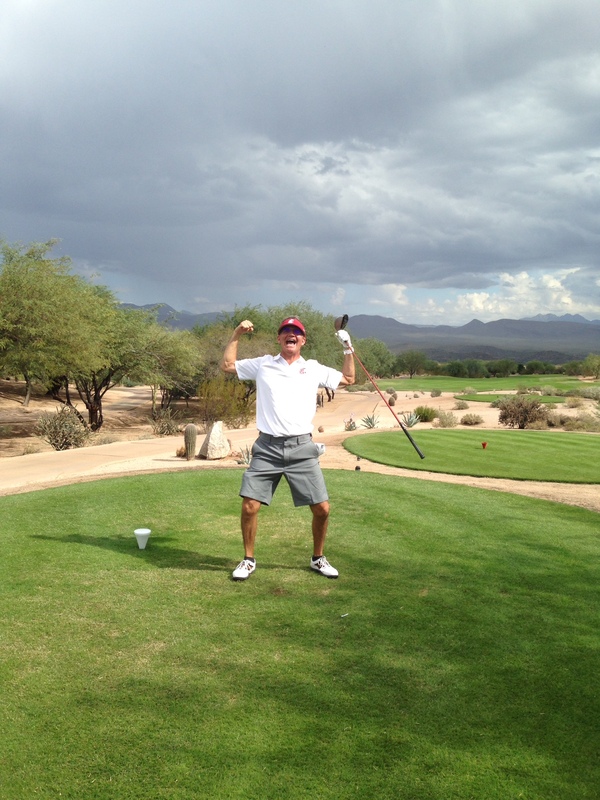 Who believes they can take me in a long drive contest? We hit some beautiful shots and occasionally found the desert. Lyn was the straightest hitter and most consistent putter (29). Pat and I matched 89’s to ramp up suspense. Lyn is the champion…of the day! In the week-long competition, Pat beat me 35-28 in head-to-head skins and I nipped him 3 days to 2 in match play. 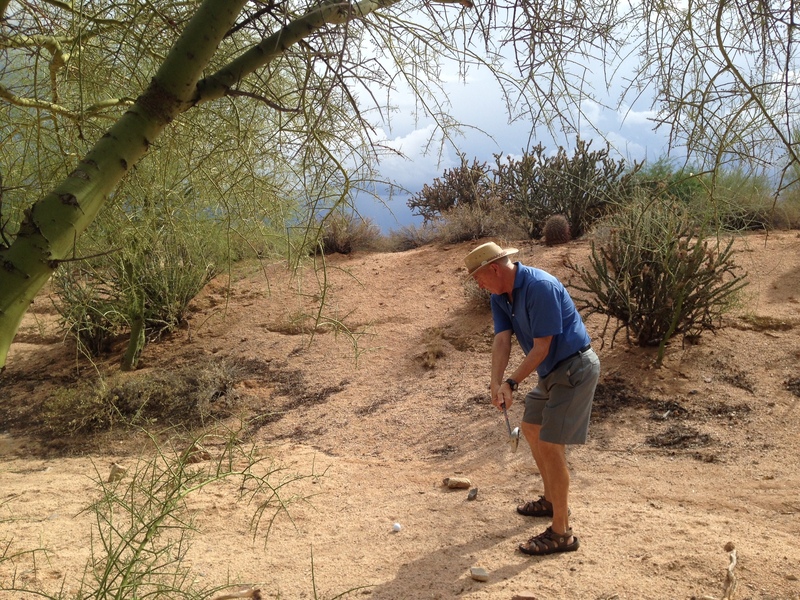 Pat made three beautiful birdies, including a hole-out from the sand that was exciting and rare for it’s range. Desert master Pat crafts a recovery shot. I hit a high, long eight iron to eight feet past and stroked it home for birdie on hole 6 (78/90). 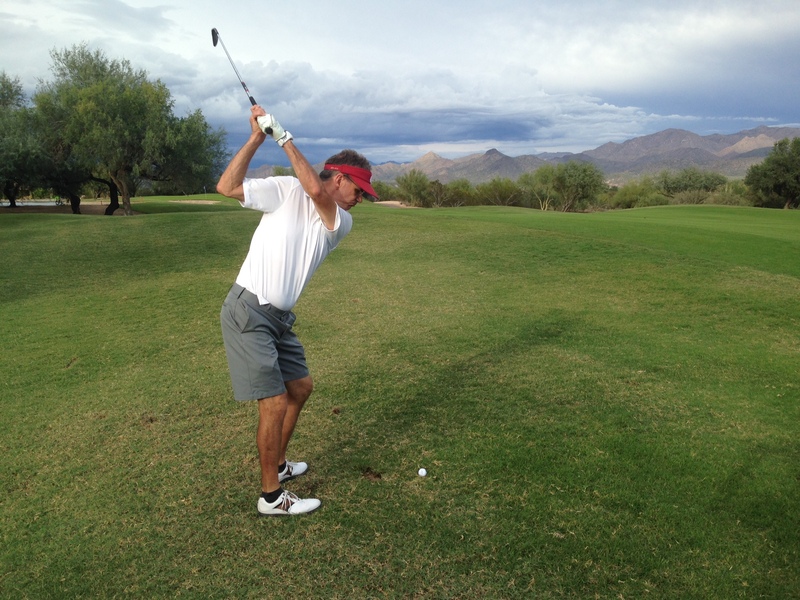 Should I shorten my backswing? We enjoyed this lovely slice of Rio Verde and the awe-inspiring drive, showcasing the Four Peaks and surrounding mountains. The views were magnificent, the company so loving and golf as I’ve never seen it before. Wow! 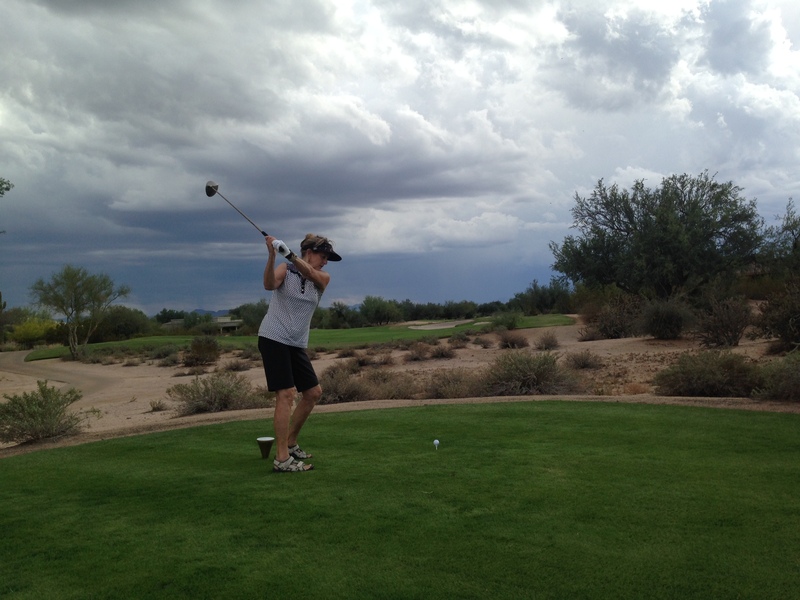 I am a desert golf lover! Bring on the long drive contest! This may be the ultimate climax after amazing preludes at classy desert courses. 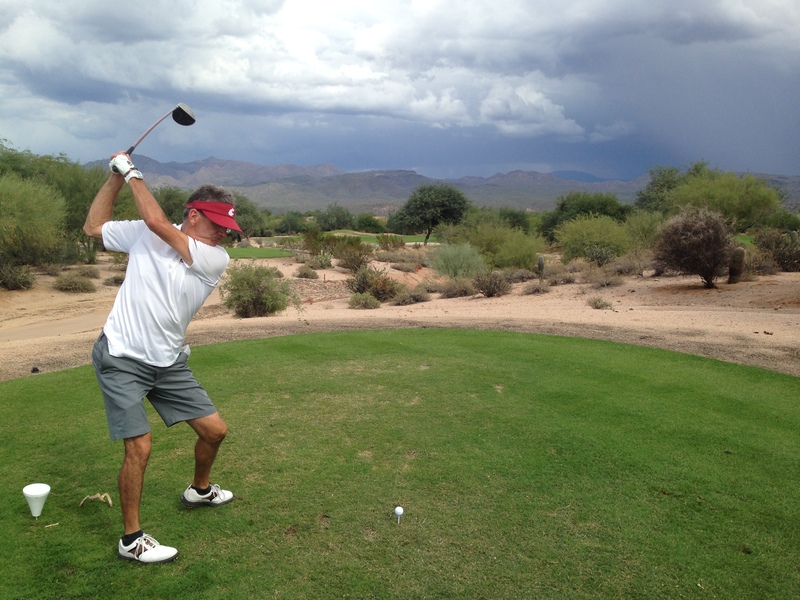 The Peaks course at Tonto Verde will serve as the championship venue for the 2015 Erickson Desert Open. What a privilege it is to have entered! I hope next year’s field is larger. If not, c’est la vie and lucky me! 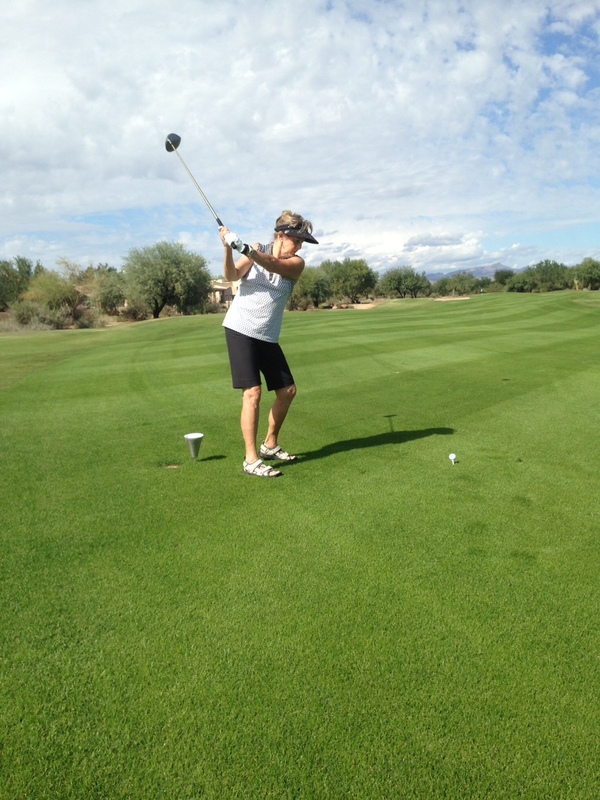 Desert target golf on small, fast and undulating greens is so appropriate after the tracks we’ve enjoyed. This links quintuple has been by far the most incredible golfing experience of my life. Let the good times roll!